1. Many people have taken different views about the making of the universe and the creation of all things, and each man has laid down the law just as he pleased. Some say that all things have come into being by themselves, and only through chance; These include, for example, the Epicureans, who tell us in their self-contempt, that the universal providence of God does not exist, speaking right in the face of obvious fact and experience. 2. For if, as they say, everything has had its beginning by itself, and without any purpose, it would follow that everything had come simply into being, so as to be alike and not distinct. For it would follow because of the unity of things that everything must be sun or moon, and in the case of men it would follow that everything must be a hand, or an eye, or a foot. But clearly this is not so. On the contrary, we see that there is a distinction between the sun, moon, and earth; and again, in the case of human bodies, a difference between foot, hand, and head. Now, such separate arrangements as this tells us that it is not because they have come into being of themselves without purpose, but it shows us that a cause preceded them; and from this cause it is possible to apprehend God as the Maker and Orderer of all things. 3. But others, including Plato, who is held in such high regard among the Greeks, argue that God has made the world out of matter which was previously existing and which had no beginning. They say that God could have made anything if the material had not already existed; just as the carpenter needs the wood to already exist and be easily available, to enable him to make anything at all. 4. But when they say this they do not realise that they are making God weak. For if He is not Himself the cause of matter existing, but He only makes things out of previously existing material, then He is surely shown to be weak, because he is unable to produce anything which He has made without pre-existing matter. Just as it is without doubt a weakness of the carpenter not to be able to make anything without his timber. If we think about it, had not matter already existed, God would not have been able to make anything. How then could He be called the Maker and Creator, if He owes His ability to make things to some other source—namely, to matter itself? So if this is the case, according to their theory, God is only a Mechanic, and not a Creator out of nothing. If only He works using existing material, but is not Himself the cause of the material coming into existence. For He cannot in any sense be called the Creator unless He is Creator of the material out of which the things created have in turn been made. 5. And the members of various other groups all imagine to themselves a different maker of all things, one other than the Father of our Lord Jesus Christ, and they are in deep blindness even regarding the words they use. 6. For the Lord says to the Jews: “Have you not read that from the beginning that He who created them made them male and female, and said, For this reason shall a man leave his father and mother, and shall be united to his wife, and the two shall become one flesh?” and then, referring to the Creator, says, “What, therefore, God has joined together let no man put asunder”. How then can these men insist that the creation is independent of the Father? Or if, in the words of John, who says, making no exception, “All things were made by Him,” and “without Him was not anything made,” how could the maker of all these things be another, distinct from the Father of Christ? 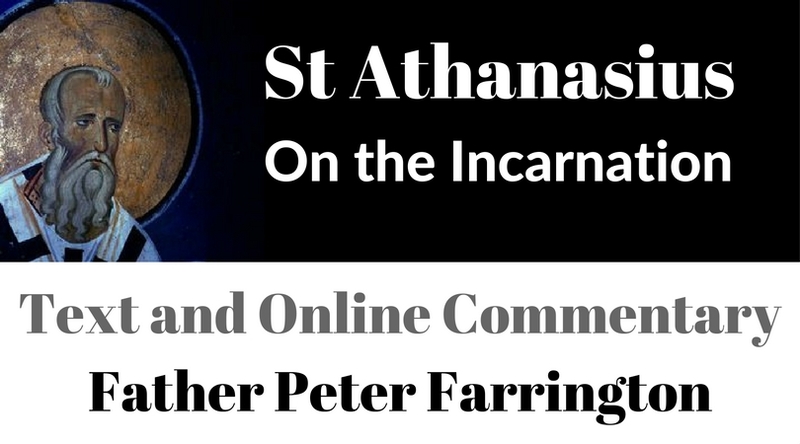 In this second chapter, St Athanasius reviews some of the arguments he has used in his previous text Against the Heathen. This first section is surely very interesting since it shows us that the popular view, held by many in the West, that the whole universe came into being by chance and that it has no meaning or purpose, is not a modern one, but was one option in the Greek pagan philosophical and religious world view. St Athanasius rejects such a materialistic worldview on the basis of both the nature of the universe and the experience of beyond nature. He continues in the second section, saying that if the universe had come into being by chance and without purpose then we would expect to see everything that exists as an formless mass of substance. There would be no organisation in such a universe. On the contrary, and here again St Athanasius shows that modern conversations about God and the universe are in fact ancient ones, he uses the fact of the organised and complex nature of the universe and of the human body to show that there must be an organised cause behind such detailed and distinct structure. There must be intelligence and therefore purpose in the creation of the universe since such order and structure is not possible by mere chance. St Athanasius wants to argue that the fact of this order points to a Maker, and that Maker is God, and is manifest even in his Creation. In the third section he addresses the opinion of the Platonists, which was that matter had always existed and was eternal, and so God was a divine being who had used what already existed to make the universe. It is interesting that some scientists, absolutely unwilling to consider that a creator could possible exist, are once again seeking to use the argument that matter and the universe have just always existed, and that there is no need for a creator, so that the universe, rather incomprehensibly and against all scientific principles, must have no cause at all. He expands on this in the fourth section, where he shows that if God cannot create anything himself, but can only work on pre-existing matter, then he is not much of a God at all, and is a mechanic rather than a creator. Indeed, he wonders what would have happened had matter not existed in such a way of thinking about things, since God, in such a view would not have been able to do anything. St Athanasius then turns his thoughts to the heretics, Gnostics and others, who imagined that there was a different God who had created the universe, and who was not the same as the Father of the Lord Jesus Christ. He uses the words of Scripture to show that in fact the God who created all things, the universe and mankind, both male and female, is the same God and Father of the Lord Jesus Christ. What has he wanted to show in this chapter? It is that the Christian God is the Creator, and that he is the same one who is the Father of the Lord Jesus Christ, and that the universe has been created with purpose by this Creative Father.